Samsung has gone with a 5" 1280 x 720px display of the Super AMOLED type. Pixel density is a little below what's become known as Retina territory but is still perfectly adequate at 294 pixels per inch. Since this is an OLED panel contrast is practically unmeasurable (meaning excellent), blacks should be as deep as technologically-possible (meaning 0 or excellent) and colors should be very saturated and vibrant, if not accurate. Samsung bundles its display expertise in the form of display modes meant to adjust the panel to your visual liking. The default mode is adaptive display which automatically optimizes the screen color rendering depending on the app you're using it in - Gallery, Camera, Internet, Video or Google Play Books. It's not compatible with third party apps. The other modes include AMOLED cinema, which is the most vibrant of all, AMOLED photo which is less vibrant and Basic, which turns your beautiful display into colorless dull canvas. 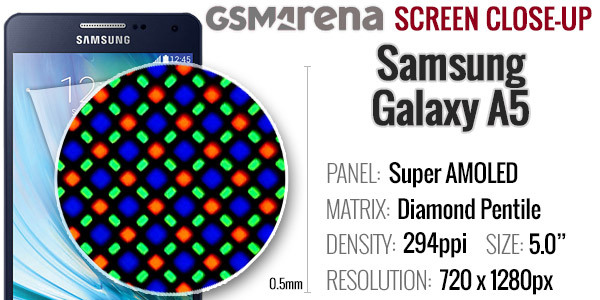 When viewed under a microscope, the diamond PenTile matrix of the Samsung Galaxy A5 can be observed. It's the same layout as the one found on the Galaxy Alpha, Galaxy S4 and the Galaxy S5 mini to name a few. 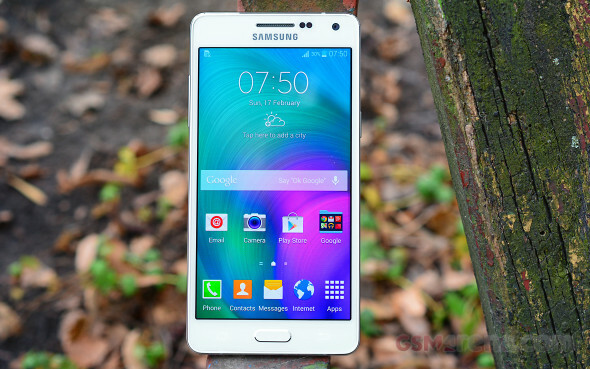 The 5" display of the Samsung Galaxy A5 is among the best we've seen. It offers the traditional deepest blacks and excellent contrast but is also very bright for an AMOLED unit. It's not quite as bright as the Samsung Galaxy A3 but comes close. Thanks to Super AMOLED's low reflectivity the panel is among the best we've seen in direct sunlight. On-screen content remains legible and the contrast doesn't deteriorate much under light. Viewing angles are also very good on the Samsung Galaxy A5 rounding off a complete and quality display package. The Samsung Galaxy A5 comes with a 2,300mAh battery unit that's non removable. We tested both the Galaxy A5 Duos in both single SIM and dual SIM configuration and we came to the conclusion that adding the second SIM deducts about 5 hours off your consolidated battery runtime with the standby times taking the more serious hit. The call times were impressive on both devices and the browsing and video playback tests are good. 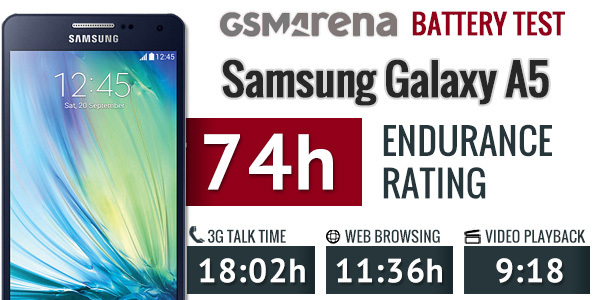 The Samsung Galaxy A5 scored 74 hours of endurance in our proprietary multi-discipline test. 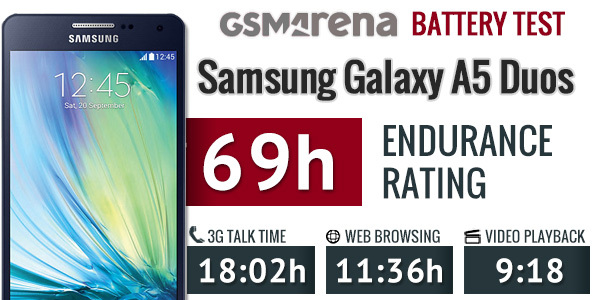 The Samsung Galaxy A5 Duos scored a rating of 69 hours under the same usage pattern - a daily usage of 1 hour worth of video watching, 1 hour worth of web browsing and 1 hour worth of making calls. The Samsung Galaxy A5 comes loaded with wireless connectivity features. LTE starts with LTE Cat. 4 (up to 150Mpbs down, 50Mbps up), while regular 2G and 3G connectivity is, of course, supported, too. The Samsung Galaxy A5 also has a dual-SIM version, which unlike the Galaxy A3, doesn't come with any hardware limitations. Both have LTE and NFC connectivity and an equal amount of RAM. The only compromise you are forced to make is to pick whether you want to use its secondary SIM slot as a microSD slot or as a SIM slot - you can't have both. There are regional versions of both smartphones that lack LTE and NFC connectivity though, so make sure you are getting the appropriate model for your needs. Back to the connectivity features, local connectivity includes Wi-Fi a/b/g/n and Wi-Fi Hotspot capabilities and dual-band connectivity. There is also support for Bluetooth 4.0 LE and ANT+, the latter allowing for easier connection to certain wireless sports accessories. NFC rounds off the wireless connectivity section. 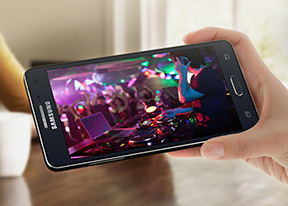 The Galaxy A5 relies on a standard microUSB 2.0 port for charging and wired data connectivity. What we do miss here is a wired TV-out option either via MHL or SlimPort. The Samsung Galaxy A5 can offer its secondary SIM slot as a microSD slot or as a SIM slot - you can't have both.